Don’t miss the latest country club decor fashion in the USA! Keep your customers comfortable & enhance the environment of your institution with our luxurious Turkish towels! Do you have a spa? Or a country club? Maybe a hotel? Perhaps you run a wellness center. One of the most important things for your success is happy customers. 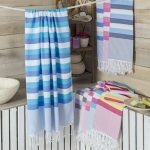 It is very easy with our heavenly soft, highly absorbent, quick-drying, durable, and stylish Turkish towels. In this week’s blog post, we’ll tell you about why decorating your institution and handing your customers our premium quality & elegant Turkish towels are a great idea. Let’s get started! 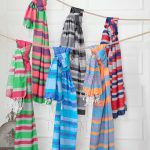 Turkish towels, originally known as peshtemal and hammam towel, are not just towels! They are centuries old Anatolian tradition. Used by all classes of the Ottoman Empire for centuries, texture & designs of Turkish towels have developed significantly. While garnished peshtemals were used by the royal family & the rich people of the Ottoman Empire as a symbol of wealth, craftsmen used them as a symbol of mastership. Housewives and field workers have used them as aprons. People used them to dry themselves after a relaxing hammam session! In short, Turkish towels are more than ordinary towels! They are an important part of Anatolian culture & history! Your customers will think that you consider even the smallest detail to make them happy once you hand them our luxurious Turkish towels. As you already know, offering a great service to your customers is extremely important! Thus, you must use high-quality products along with your service! 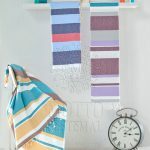 Now, we’ll tell you what our Turkish towels are capable of providing your customers with! In short, our Turkish towels will provide your customers with everything they expect from you along with your service! Do you know what makes our Turkish towels even better? The fact that you can confidently & safely hand them to your customers. We don’t only manufacture Turkish towels 100% from premium quality cotton, we also use high-quality dyes to apply the designs on them! The dyeing process is held in the best dye-house in Denizli/TURKEY. You can safely hand our products to your customers as they don’t contain any harmful or allergen material on their textures! 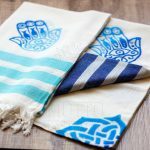 We Have The Right Turkish Towel Design For You! As a peshtemal manufacturer & wholesaler, our designers follow the fashion 24/7 to come up with eye-catching designs for your institution! We work hard to offer you design for every kind of customers you might have! 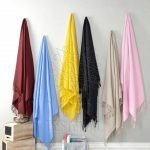 We offer minimalistic designs such as Funky Beach Towel for those who love simplicity. We have traditional hammam towel designs like Sultan Peshtemal for those who love history & culture! 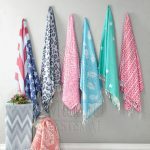 We have vibrant Turkish beach towel designs like Jacquard Turkish Towels for those who love lively designs! In short, we have a design for you! You can easily discover our entire peshtemal collection by visiting our products page! You can also find detailed information about our products on their pages! We don’t only offer you luxurious Turkish towels but we also offer you a fast & reliable service! And all of it is not expensive! As a responsible Turkish towel manufacturer and wholesaler, we are aware of your needs! So, we offer you reasonable prices for our high-quality products and reliable service! We work with the most reliable courier companies such as TNT and UPS! Once you place your order, we’ll handle all the boring & time-consuming processes for you! You can contact us 24/7 via email for any questions about our Turkish towels, services, and prices! You can find our email address by visiting our contacts page easily! Before we finish our post, we want to summarize what we talked about this week! 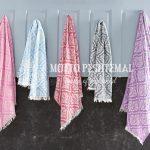 Turkish towels are not ordinary towels! They’re an important part of Anatolian culture & history. Handing Turkish towels to your customers will be a classy touch for your institution. 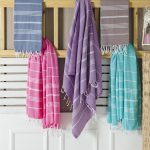 As a peshtemal manufacturer and wholesaler, we weave our products 100% from hand-picked cotton! We also use anti-allergen, harmless dyes to apply our designs. You can confidently decorate your institution with our luxurious designs! We follow the fashion for you! We offer a viable design for every kind of institution! We also offer a wide color spectrum, so you can easily find the perfect peshtemal for your business! We offer fast & reliable services and reasonable prices for everything! You can contact us for more detailed information at any time! We’ll answer your questions and Turkish towel wholesale needs as soon as possible! From Kızılcabölük, with love! 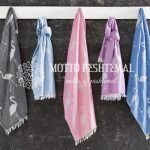 Motto Peshtemal, peshtemal manufacturer and wholesaler, wishes you a happy year!